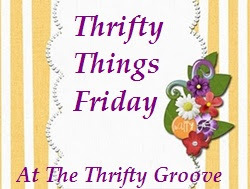 The Thrifty Groove: Thrifty Things Friday #15! While at the campground, when Saturday rolls around, the Princess and I head to a local outdoor flea market. It is not a large flea market but, it is always a fun one to visit. And I generally find some good deals. So, while Troy is doing his thing around our trailer, Princess and I head off for an adventure. It was the fullest I have seen it. I took the above picture from where we parked. By the time the Princess and I walked over to the first vendor, both of us were sweating so bad and our faces were completely flushed. 96 degrees and the humidity was 83%. Not a fun day weather-wise. I bought this set of vintage pink glass sorbet glasses for $2.00. They are in desperate need of serious soaking. I wandered over this side and found one treasure. This old vintage glass knob that at one time had been painted white. I paid a $1.00 for it. I picked up a set of 3 purple glasses from these folks for $1.00. Not a great deal but, I had been looking for purple glassware. Oooh, can anyone say Pyrex? That was all I bought at the flea market. I don’t know if they were just too high, not much I liked or I just wanted to get into air conditioning. After the flea market we headed to this little antique/thrift store. This is such a fun place. I didn’t think about taking pictures because I always have too many things I want to look at. I didn’t buy any of the gorgeous antique dishes and what nots she had. I really was bargain shopping. So, I headed to the back of the store which is her thrift store part. I found these vintage green and cream plates. 5 pieces for $1.00 . I just really liked the design on them. I also bought these fun wood cigar boxes at a $1.00 a piece. Not vintage, but fun to do different things with. After we left this store, we headed back to the campground and stopped at a yard sale along the way. I bought 2 milk glass vases for .05 each. Which worked great to add a little detail to my 4th of July table. A large clear tote with the burgundy faux animal embossing. I love these large clear ones like this for doing exactly what I was doing this day. They are perfect for flea marketing. I can see my bottle of water or my camera in it even with packages crammed in. It was $1.00. A blue wire wicker basket/tray.This also helped decorate a 4th of July table. A pale green wire and wicker basket/tray. I bought each of these fun baskets for .50 cents each. Now let’s see a few fun things that were linked last week! Tracy at Ms Bake-it found this fantastic dresser on the curb! Yup, we are talking the ultimate thrift…FREE! Faye at The Blessed Hearth not only showed us glimpses of her Olde Cottage Kitchen, she shared a great recipe for homemade Ginger Ale! Lynn at Cottage and Creek invited us into her office that she has surrounded herself with thrifted items that make her smile! Thank you ladies! I hope you grab the “I was featured” button! Now let’s see what thriftiness you have to show his week! all that pyrex makes me think I did good! Love the sorbet glasses and the white vases are such a good buy and can be used in so many different ways. Your flea market looked fun, but I hear u about the heat! You found some amazing thrifts! I love your little sorbets and that last basket has got to be worth more than 50 cents! I would have loved to shop that Pyrex table!!! Wow! You did find some great treasures and my hat is off to you for staying out in the hot weather!! I would have ran for the air conditioned car as fast as I could! Love the pink depression glass and the green and white dishes are so cute. That looks like it was a lot of fun. I love the cigar boxes and the flower basket. Thanks for having us! I would be all over that Pyrex! Thanks for hosting! Wow what a vision of goodies. I would have been all for those purple glasses for sure. I don't know if I could have taken that heat however, you are a trooper for sure. I know how you feel in this hot weather. Love the purple glasses they are so you! Cute sorbets and pink! Also those baskets are wonderful. Love looking at the Pyrex but unless the prices were low I'm not buying right now! I think the green & cream dishes with the Rooster are great...I might have a piece of that somewhere. You got a great deal. You do know how to find all the back rooms and deal tables in a place. You have trhifter radar. I could appreciate the vender with the whole camping tent set up. Bet they had fans running too, and lots of ice. I was supposed to head to MI next weekend with the Goofy Newfies but it would be a tough call - play with dogs on the beach or try to find great thirfting. That's a fabulous haul you made! I'll be out with my eyes peeled for treasure so I can link up next week.Thanks for stopping by, love your header. I love how you find great buys at such great prices! For me that is part of the fun now; trying to get the very best price and being okay with passing something up if it doesn't meet my price objective. It sure is cheap entertainment, isn't it? I could have been happy with any of your treasures, but I think the dishes and the cigar boxes would have jumped in my arms first. So much fun! Love the plates! Looks like fun. The cigar boxes were a great price! I always look for square one to hold cocktail napkins. Wow! Thrifting and ice cream, sounds like the perfect day to me. Love the purple glasses. I've never seen any that color. Wow I keep on finding amazing linky parties and inspirationas a new blogger!!! This looks so profitable and hardly ever visit these markets but am cured and as its Saturday tomoroow,guess where I am going....Lovely to stumble across all these finds and your glasses are lovely. Your purple tumblers and sorbet dishes are divine! Five dishes for $1? You can't beat that! I'm looking forward to hopping around the blog party. Thanks for hosting! There is not anything I like better than a great sale like that.. Not the heat, though..
Hi Diann, Your bargins are really good bargins.I love the purple glasses,I think $1 is a great price. I like seeing all the tables at the flea market. Can't wait to see what you do with the cigar boxes. Thank you for the very nice time. OMG! BARGAINS.... and I am a teacher. duh..
You found a great place for bargains. I've got to say I would have been a noodle after about five minutes in the heat. I love the fleas, but I have to wait for cooler temps. I sure enjoyed all your photos, so thanks for taking me to the flea until I can go myself.